This one will be heavily inspired by the Music Man Axis. 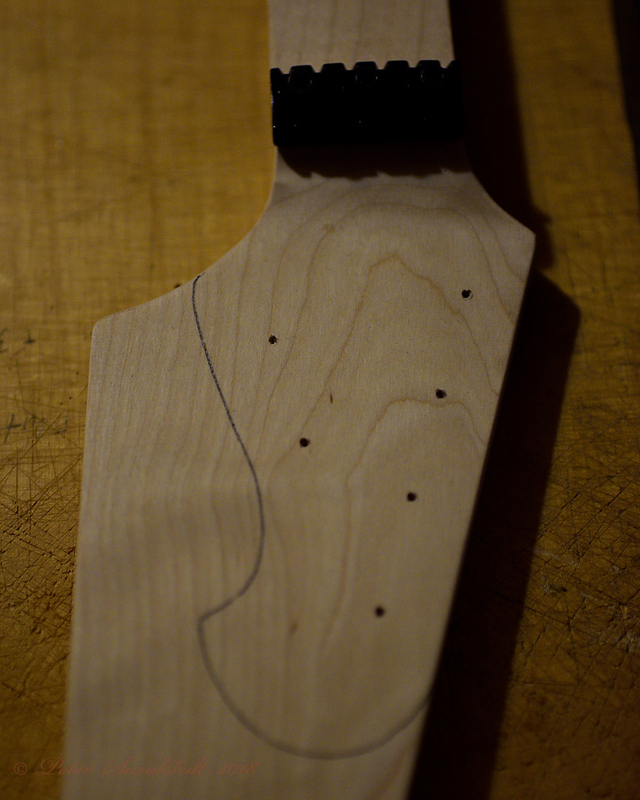 The headstock blank with an outline drawn and center-markers for the holes for the tuning machines. 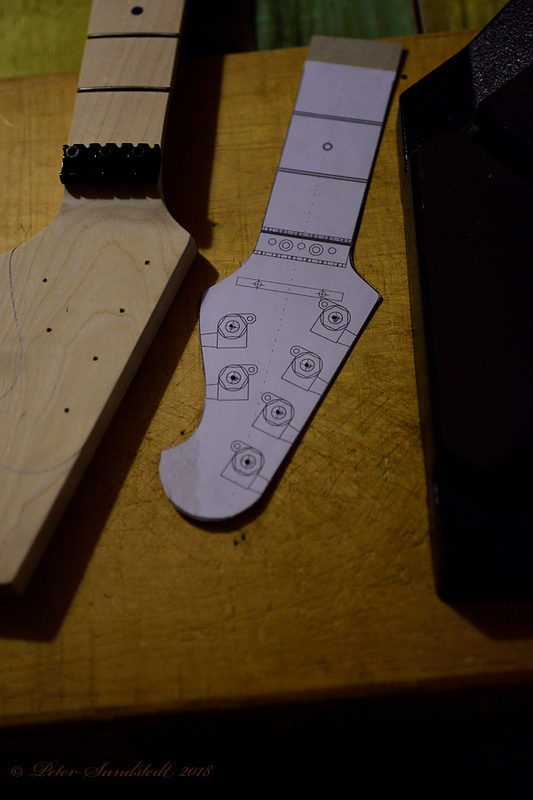 The headstock blank next to the cardboard template. 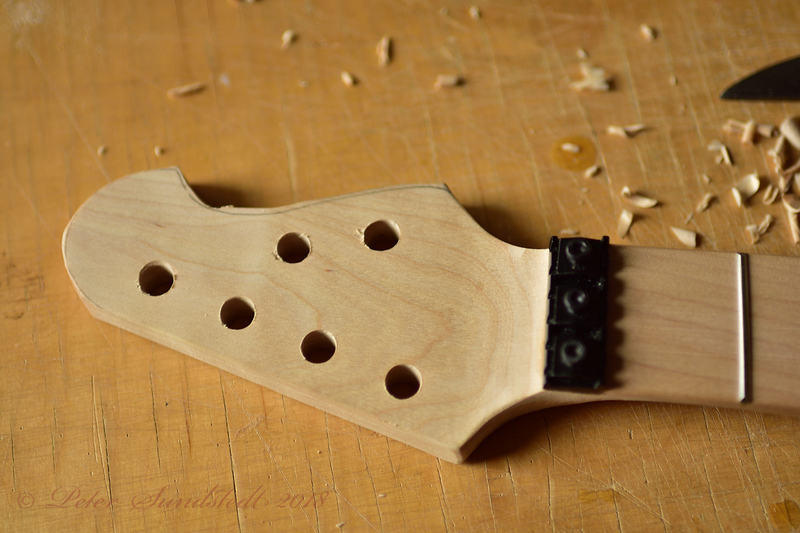 The blank with the holes drilled. I will ream them to exact size later, when it is time to start assembly. The picts are a tad too dark! 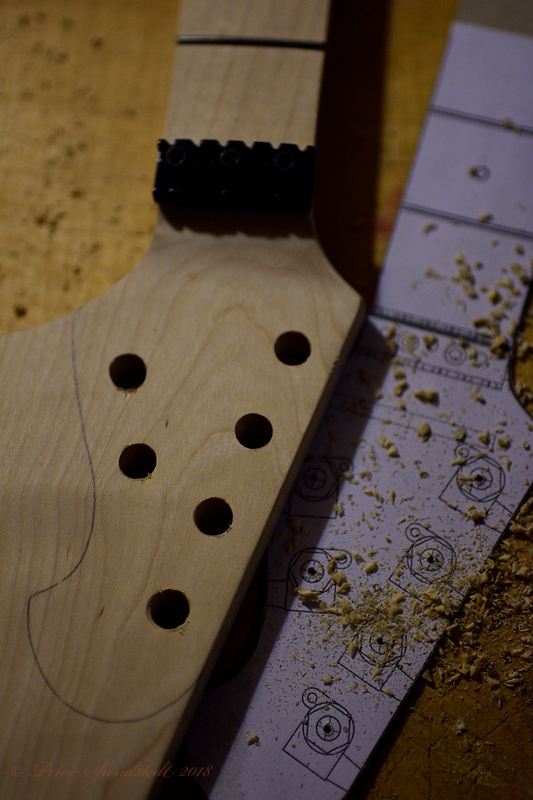 About as far from a Tele as you can get without getting into shred machines. This one is heavily inspired by the Music Man Axis. 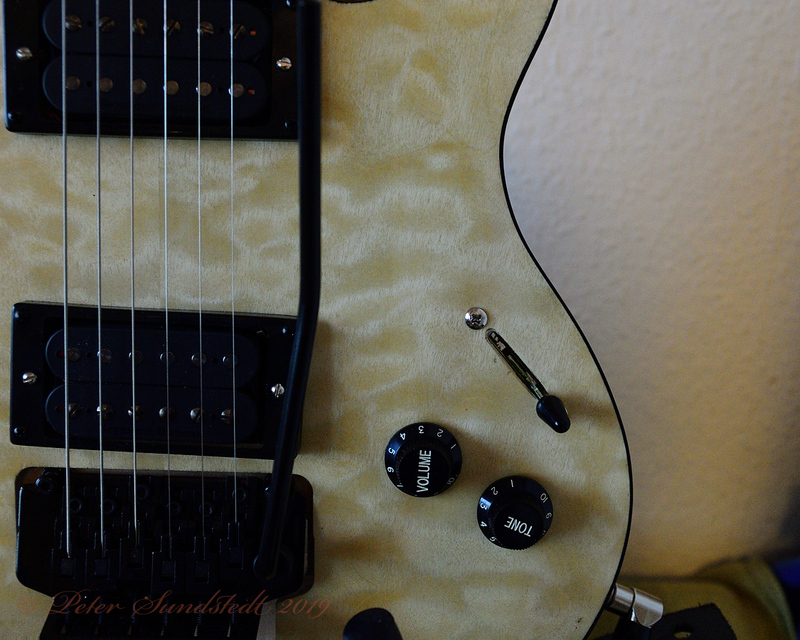 Floyd Rose, coil-split humbuckers and 4+2 headstock makes it a bit more complex to build. They are a bit on the dark side as the screen on the laptop is a bit too bright for editing. It is easy to make too small a correction. 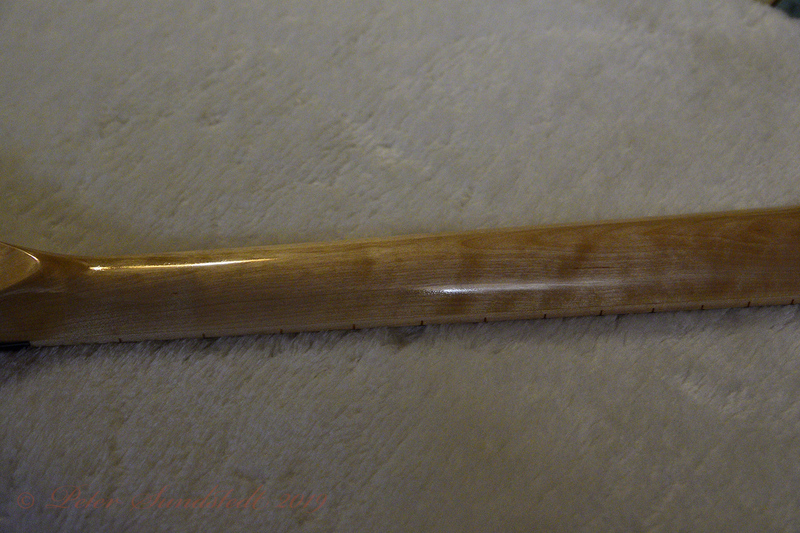 I'll try to do the coming parts of this series on a better screen, or correct the photos if I use the MBP. 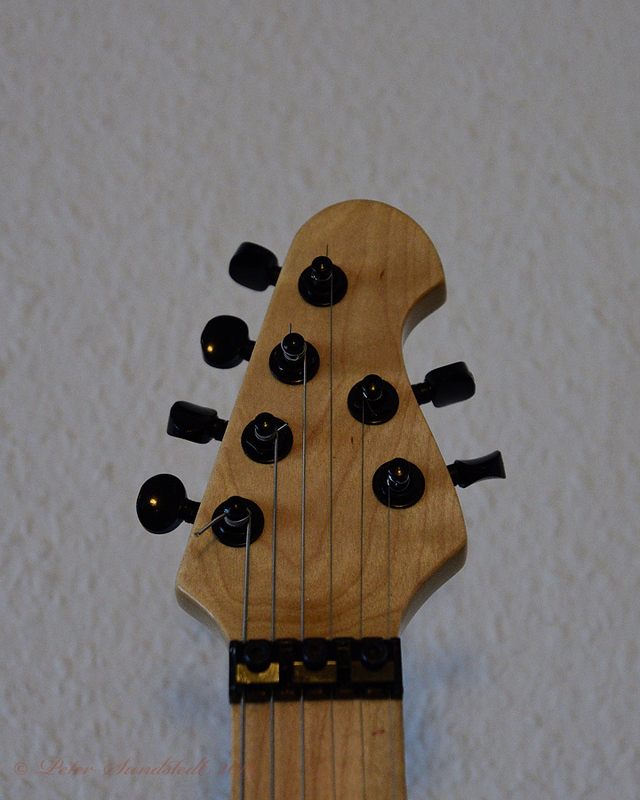 Ok, I thought you meant the headstock only is inspired by the MusicMan. 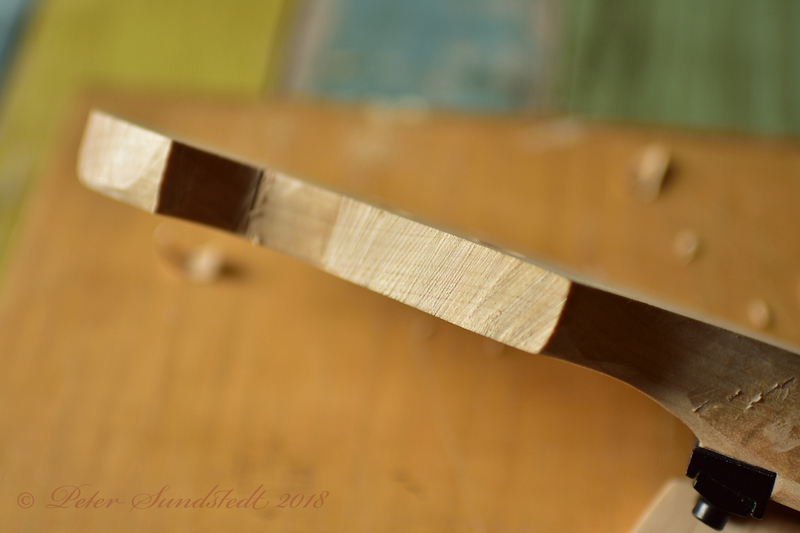 As the body has a beautiful quilt maple top and black binding, I will use Tru-oil, but applied in a slightly different way to get an end result with a higher gloss that hopefully brings out the grain even better. On the Tele, I applied the oil using a cotton rag. 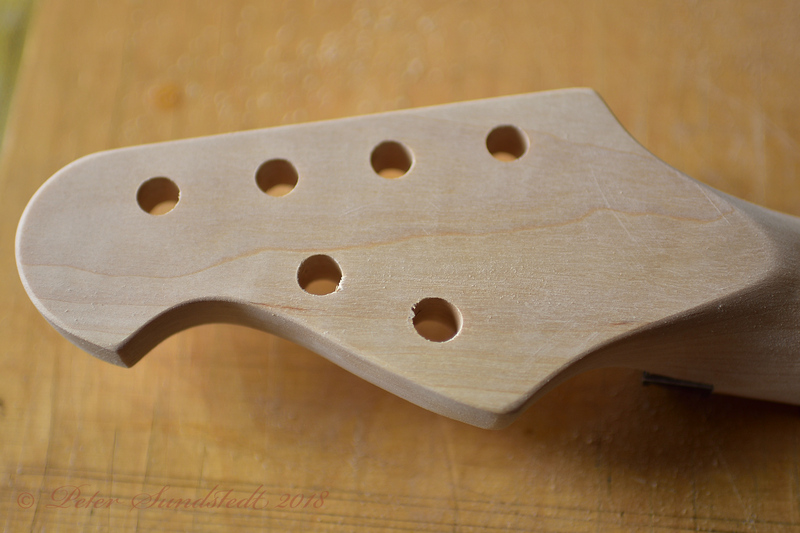 Applying it with fingers in a nitrile glove is said to get an even better finish in the end. will you be done by tomorrow? The Harley Benton kit is a bit like an IKEA flatpack. It works, but with little finesse. This Pitbull kit is much more challenging. I have already found two things I want to change... 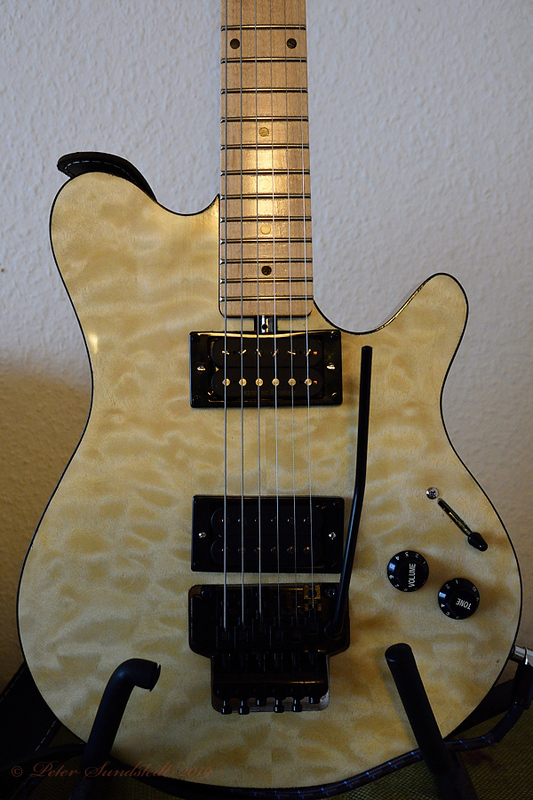 I want a tone control and I want a 5-position switch. I think I have solved how to do it. You will see how when I get there. I have already found two things I want to change... 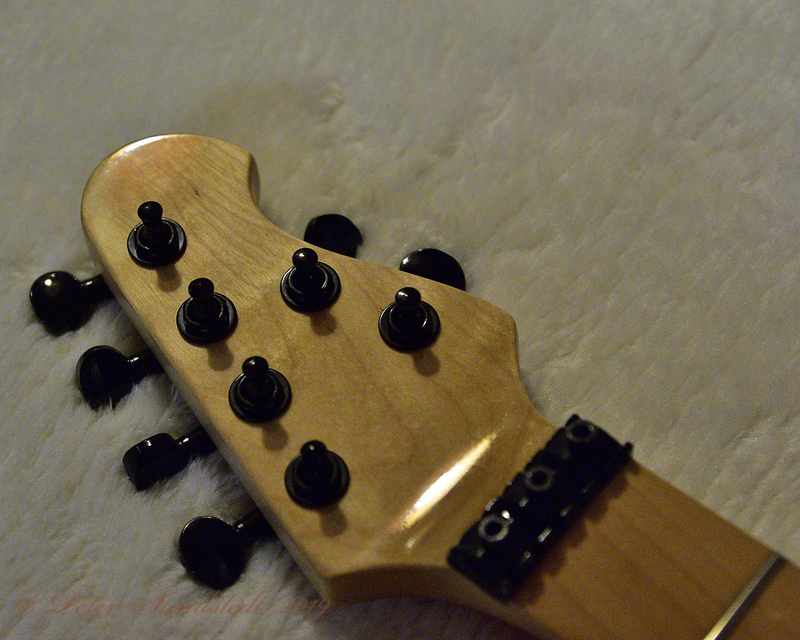 I want a tone control and I want a 5-position switch. I think I have solved how to do it. You will see how when I get there. I could be of some help when it comes to circuitry if you need. 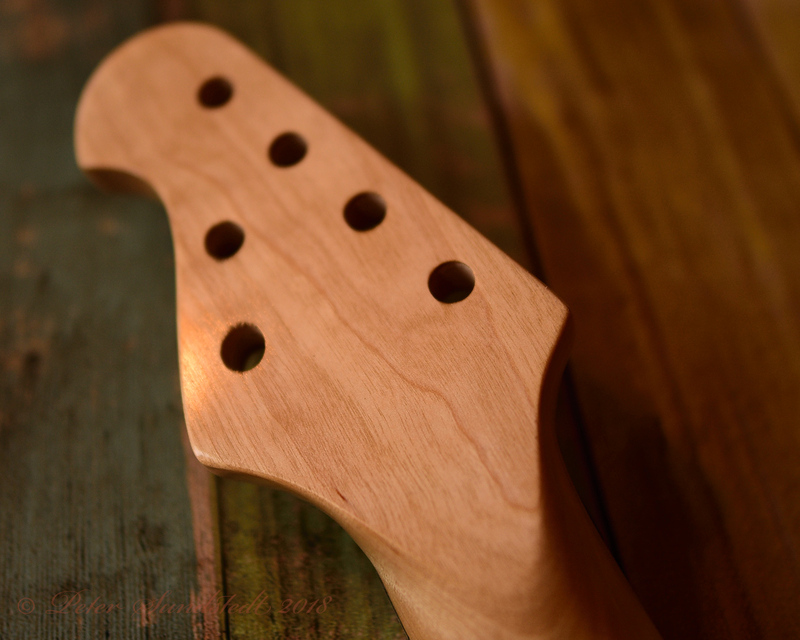 Could you post a shot of controls layout on the guitar? 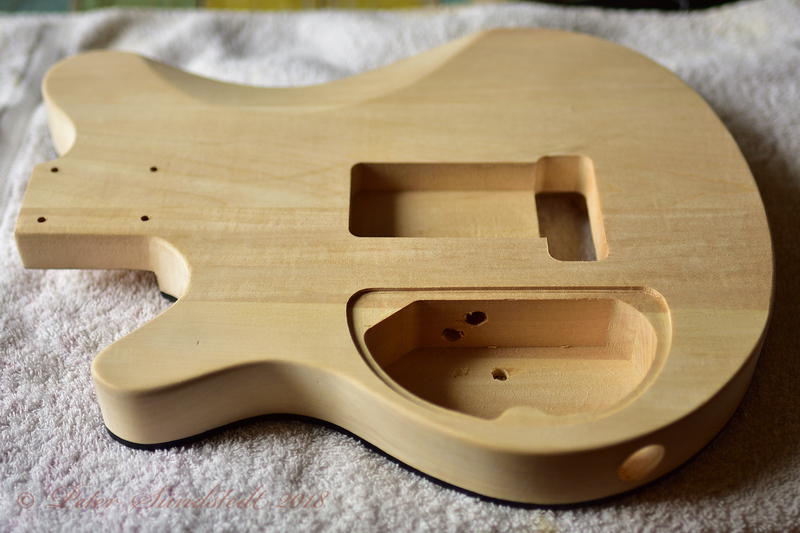 The Axis has the volume knob and the selector switch straight down under each other. This kit has the hole for the selector switch moved a bit backwards and I hope this leaves room for the Fender 5-position super selector I want to use in front of the tone pot that will live in the old selector hole. 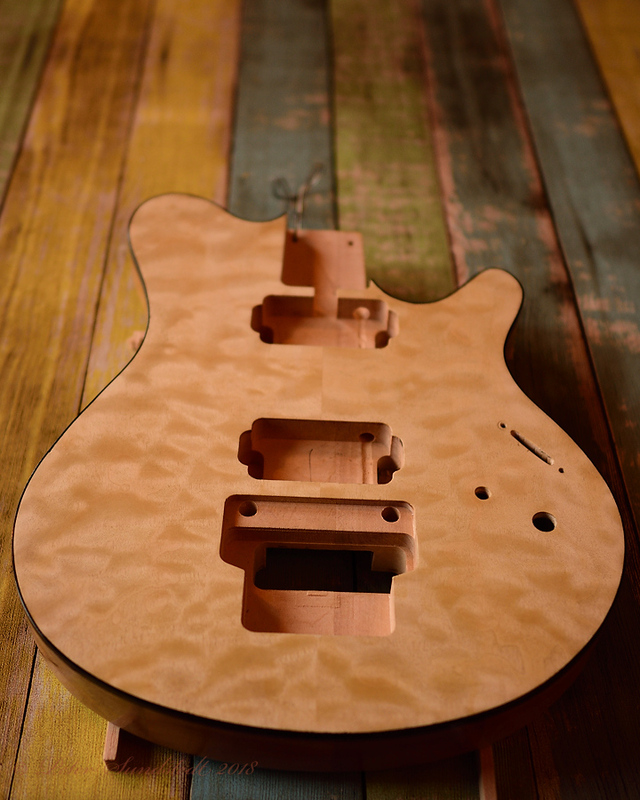 I don't want to have to plug an existing hole as the plug would show so much because of the quilted maple. 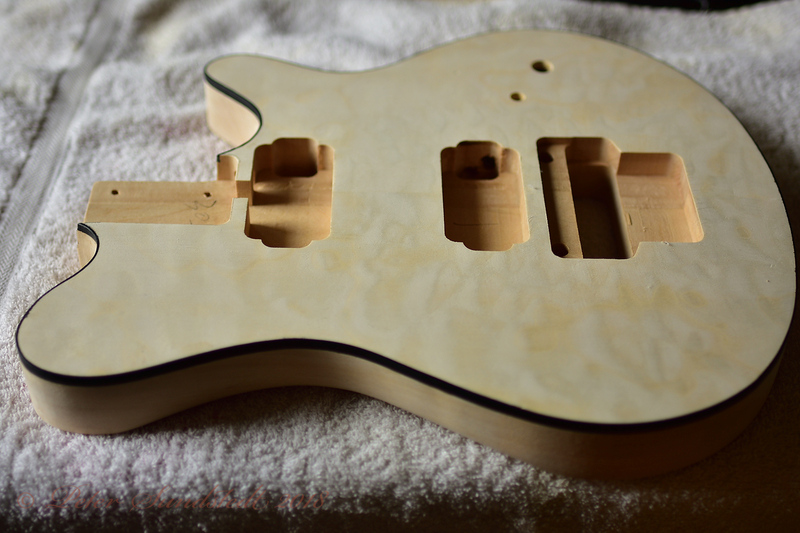 When I modified a Strat into a "fat" one, I replaced the 5way by DPDTs and TPDP. 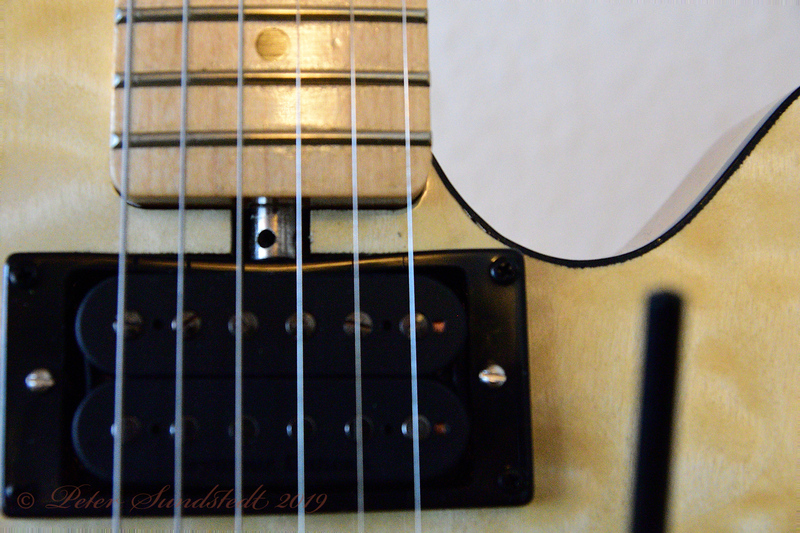 If there is room, I want he ease of use of the bridge HB, outside coils, both HBs, inside coils, neck HB sequence on a Super Switch. I have a switch and some CST pots in the mail, so they should be here before I need them. 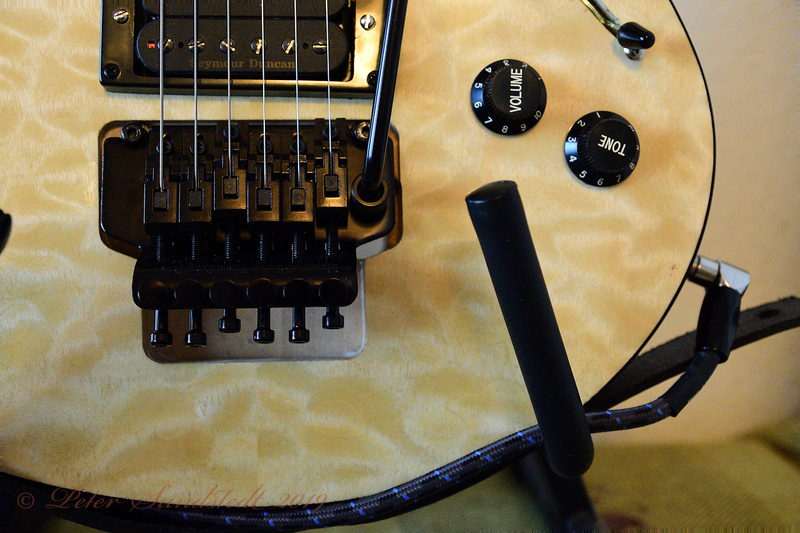 As there is no middle pickup, the 5way is ideal. 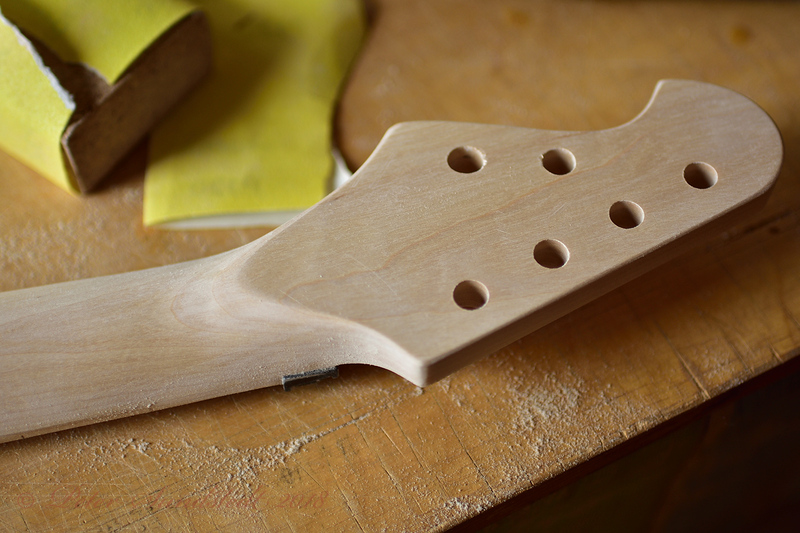 The headstock has now been roughly shaped with saw and knife. 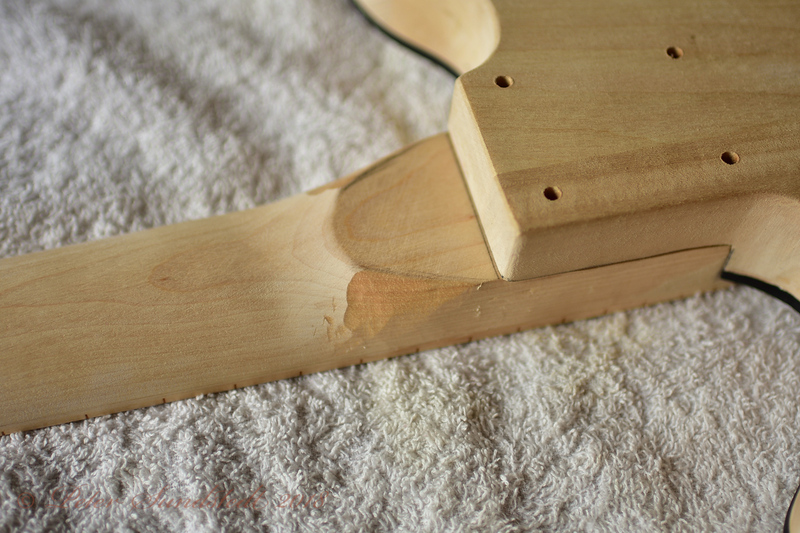 The heel has been adjusted to get a nicer transition to the body. I haven't done anything to the body yet. 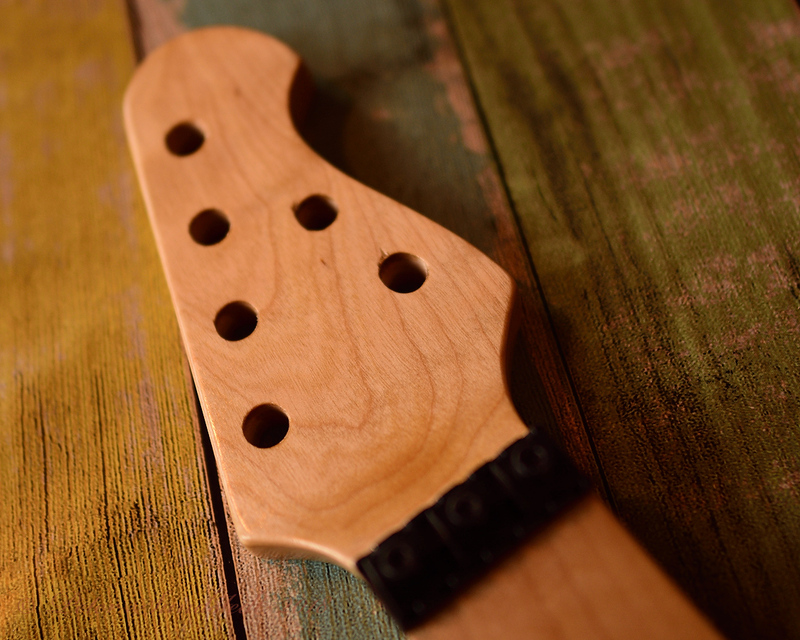 Nearly done with the 120 grit. 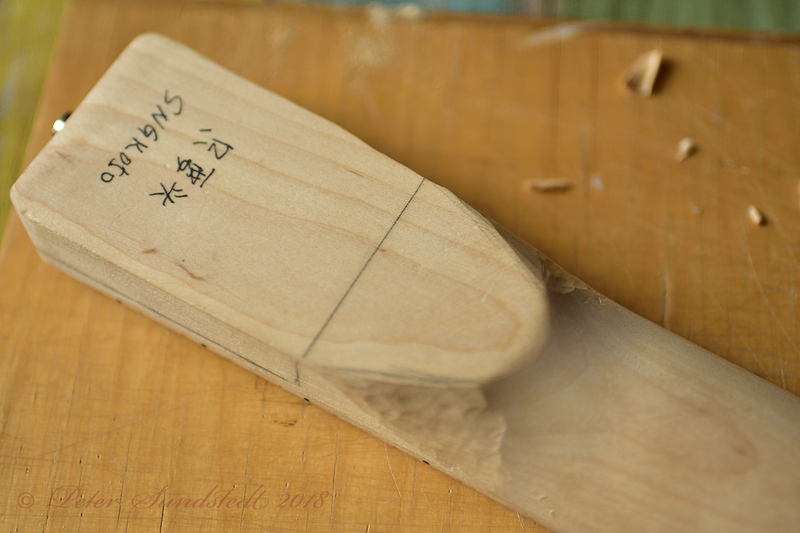 There are still some high spots to do, but the fingers lose some sensitivity if I keep at it too long. 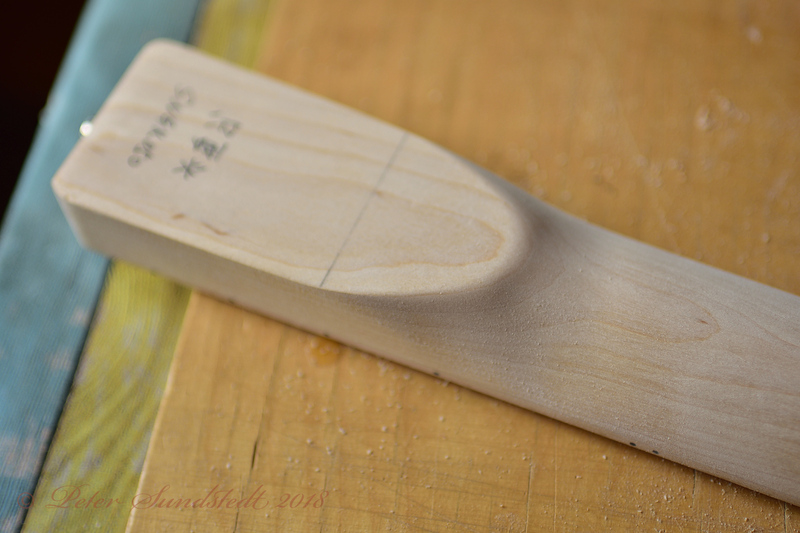 I will finish this first sanding session this evening and tomorrow will see the next, finer grit papers. 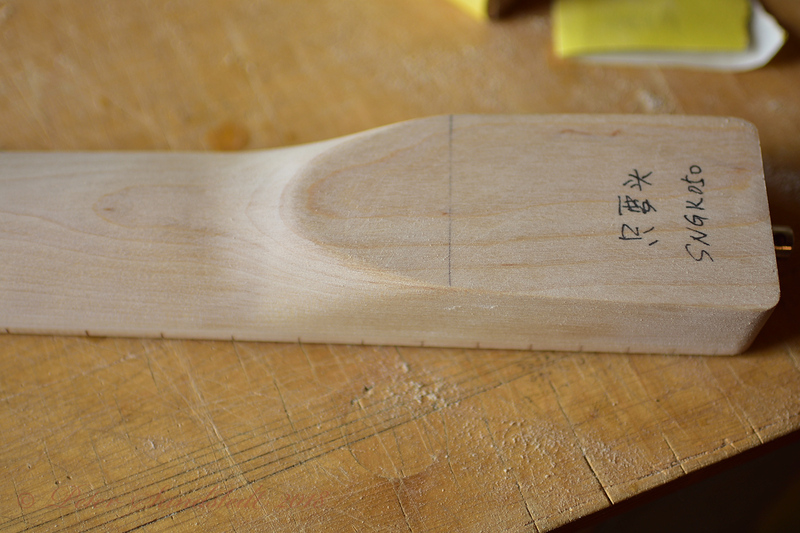 The grain is starting to pop after 9 layers of Tru-Oil. 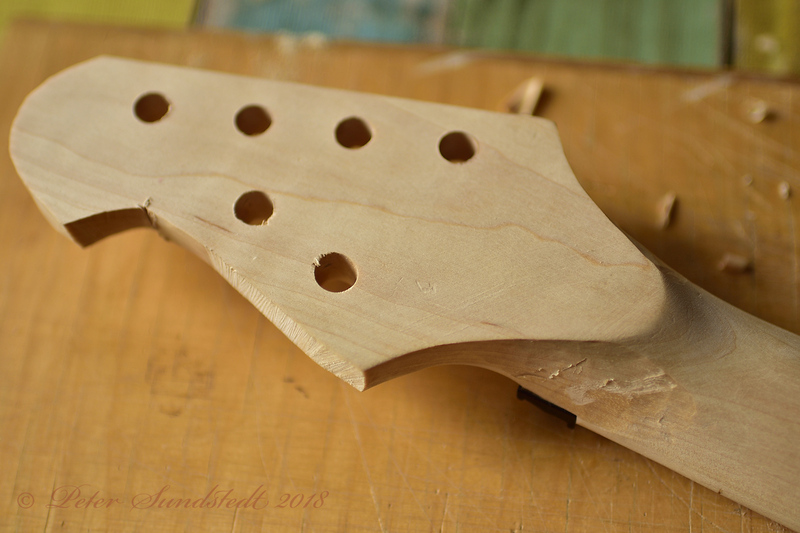 A group photo of the parts that will go into the guitar as soon as the Tru-Oil has hardened enough for me to buff the finish. 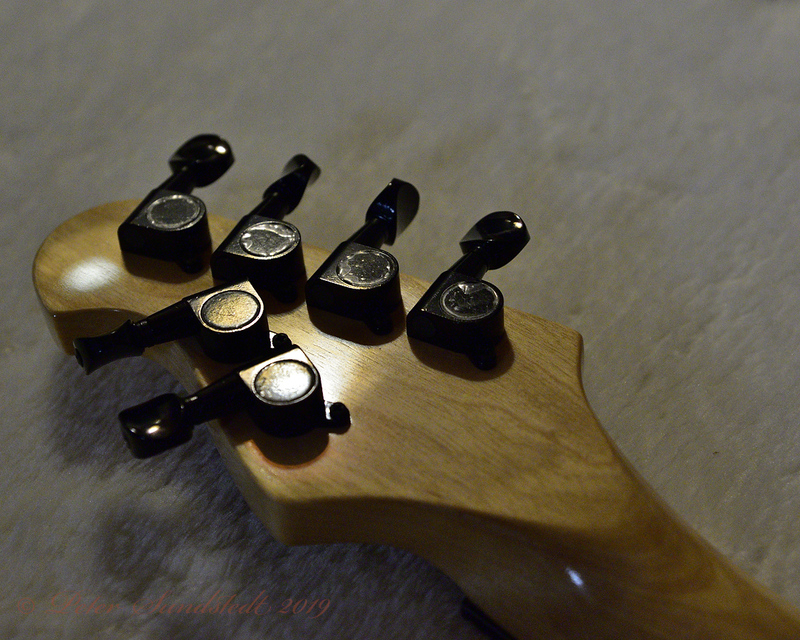 Gotoh tuning machines and a Shaller string bar will go on the head. 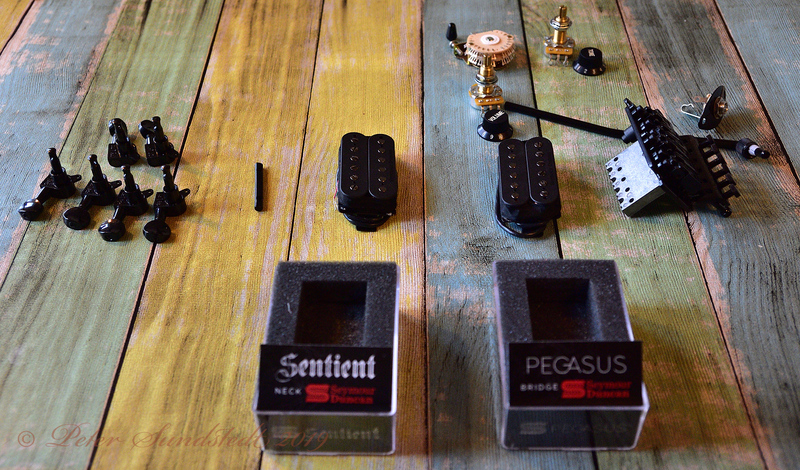 Seymour Duncan pickups, Sentient in the neck position and Pegasus at the bridge. 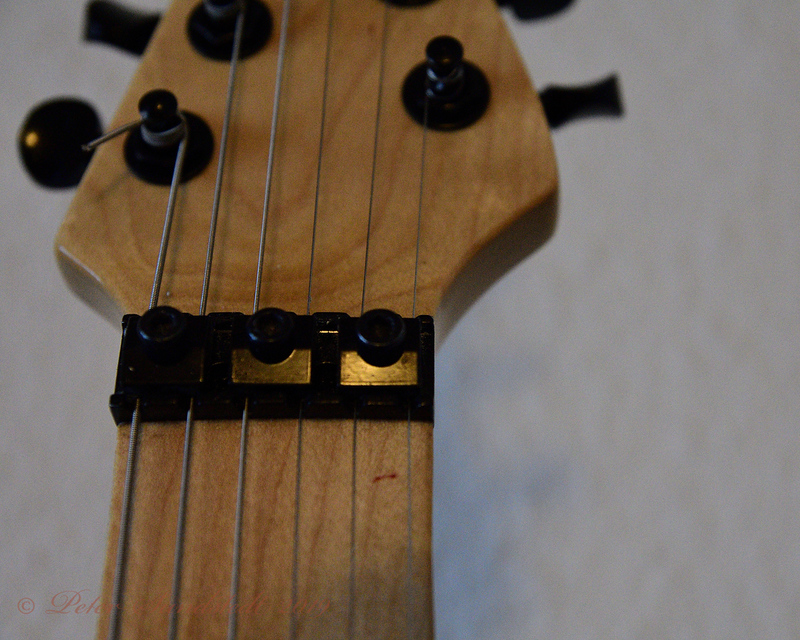 A licensed Floyd Rose to start with, it will probably be replaced with a Shaller Lockmeister sooner or later. 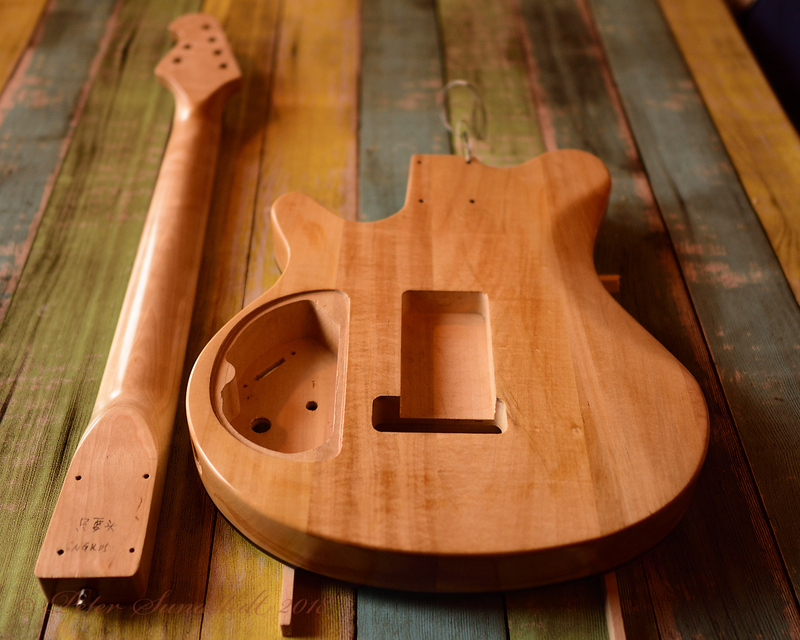 A 5-way super switch, logarithmic pot for volume and linear pot for tone. … a body to make a grown man cry! It is finished, more or less intonated and fully playable. Impressive. 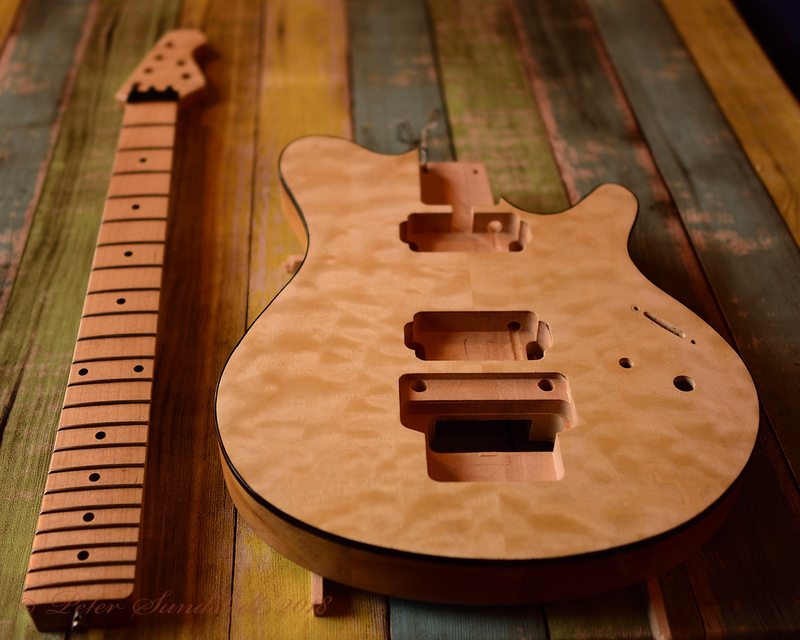 Very nice craftsmanship. Have you done this before? 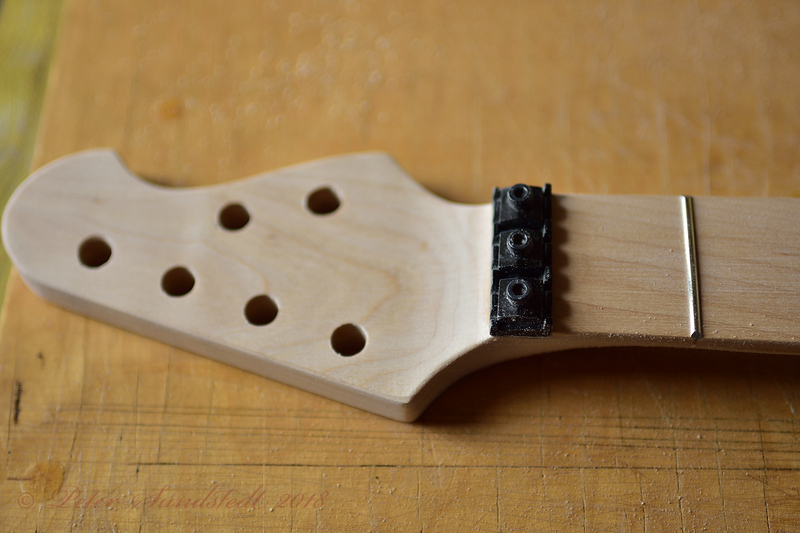 There is quite a bit left to do when it comes to adjusting things by playing around with neck relief, string height, the height of the microphones and so on. 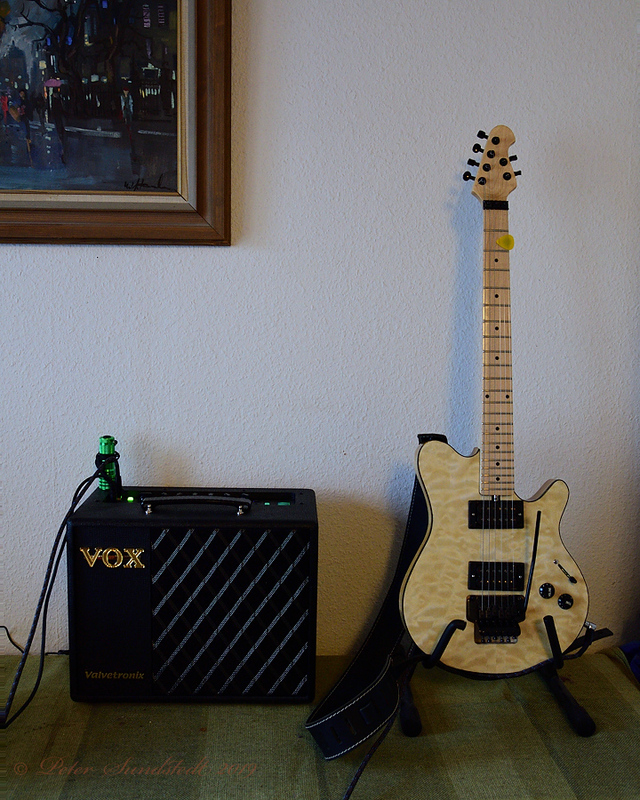 I am not sure if the licensed Floyd Rose will stay or if it will be replaced by a Schaller unit, but the instrument is playable now and sounds great through the Vox.